I wrote an article last year about the possibility of Crotone getting promoted to Serie A, which they did, and the trend of ‘unfashionable’ clubs earning the right to play against the big boys. Well, it looks like it may happen again this season as one team are currently in the automatic promotion places in Serie B as we approach the business end once again. S.P.A.L. 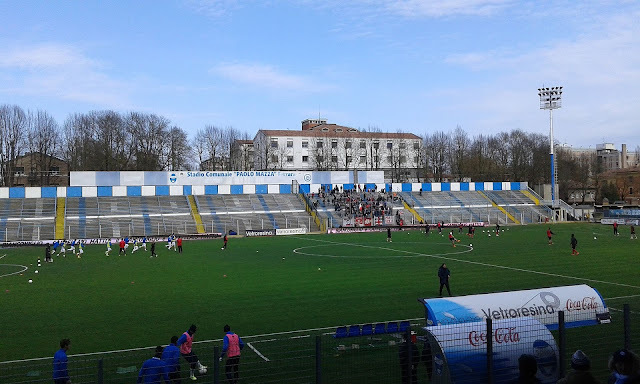 2013, better known as Società Polisportiva Ars et Labor (or simply SPAL) are based in Ferrara, Emilia-Romagna. They have played there home matches since 1928 at Stadio Paolo Mazza, named after Paolo Mazza (chairman of the club from 1946 to 1977). The club was founded in 1907 as Circolo Ars et Labor by the Salesian priest Pietro Acerbis, then was renamed in 1913 as Società Polisportiva Ars et Labor. They are the club that gave legendary Italian coach Fabio Capello his first taste of professional football at the tender age of 18 during a halcyon period when the club had a regular place in the top flight of Italian football. Under the stewardship of President Paolo Mazza, the Biancazzurri finished fifth in Serie A in the 1959-60 season and contested the Italian cup final in 1962 narrowly losing 2-1 to Napoli, having crushed Juventus 4-1 in the semi-final. Former players reads like a who’s who of Italian football - Edy Reja, Carlo Mazzone, Osvaldo Bagnoli, Armando Picchi, Ottavio Bianchi and Luigi Del Neri have all plyed their trade with the Biancazzurri. Reja and Capello were an intrinsic part of the team’s midfield during the mid sixties and both were later honoured for their achievements at the club’s centenary celebrations in 2007. Bianchi was the man who brought Maradona to Napoli and centre-half Carlo Mazzone coached Ascoli, Roma and Brescia. Osvaldo Bagnoli on the other hand, will forever be remembered as the tactician who masterminded the glorious 1985 scudetto winning team from Verona , the last time a provincial side got their hands on Italian football’s biggest prize. But as the 1970’s began, SPAL’s fortunes took a turn for the worse and the club suffered successive relegations to find itself cut adrift in the barren wastelands of Serie C. Towards the end of the decade and Mazza’s reign at the helm, SPAL managed to claw back up to Serie B but by the start of the eighties it had returned to the lower reaches where it has stayed ever since, apart from an all too brief return to Serie B in 1992. By now financial mismanagement was starting to catch up with the club from Ferrara and in 2005 it was declared bankrupt. The saviour came in the shape of businessman Gianfranco Tomasi and the club was renamed SPAL1907. By the time of their centenary in 2007, the club’s very existence was again in jeopardy and as former players returned to Ferrara to mark the special occasion, it served as a harsh reminder to their loyal followers of just how much the club had given to the game in Italy and just how bad things had become. In the summer of 2012, after suffering a second bankruptcy, the club was refounded for the third time as Società Sportiva Dilettantistica Real S.P.A.L. and would begin life in Serie D.
In July 2013, SPAL merged with the other local club in Ferrara, Giacomense, owned by the Colombarini family. The new team, born from the merger, was named S.P.A.L 2013, with the Colombarini’s transferring the structure of Giacomense to SPAL with Walter Mattioli stepping in as the new club president. Under the new management, the Biancazurri quickly found their feet and, with two promotions in three seasons, they restored the football pride in the city of Ferrara as new ambitions arise with fans already dreaming big. Coach Leonardo Semplici enjoys an attacking brand of football and, along with President Mattioli, has stated that the club’s strategy doesn’t involve big spending, but rather developing certain ideas and programs to make a competitive team with a humble identity that relies on, above all, teamwork. Promotion from Lego Pro was secured last season and the club’s first campaign in Serie B for over 25 years was meant to be one of consolidation. Little did they know that, with goals from ex Leeds man Mirco Antenucci, Milan loanee Gianmarco Zigoni and veteran ex Lazio man Sergio Floccari then the dream may well become a reality.